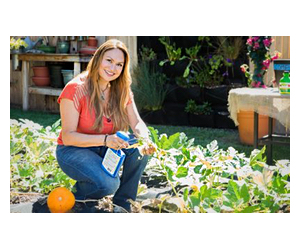 Drought conditions have forced extreme water conservation measures in Los Angeles gardens and it shows! I’ve never seen so many parched looking lawns, especially now that we are allowed to water our yards only two days per week. 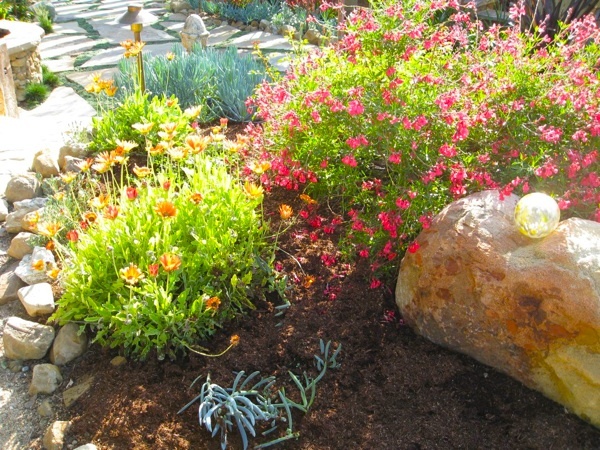 What Angelenos need are bright, colorful drought-tolerant plants for their gardens! Fortunately for me, I’ve always had a “plant-driven yard” with little to no lawn to look after so my yard is still looking great! How is your yard holding up? Does it need a color injection? 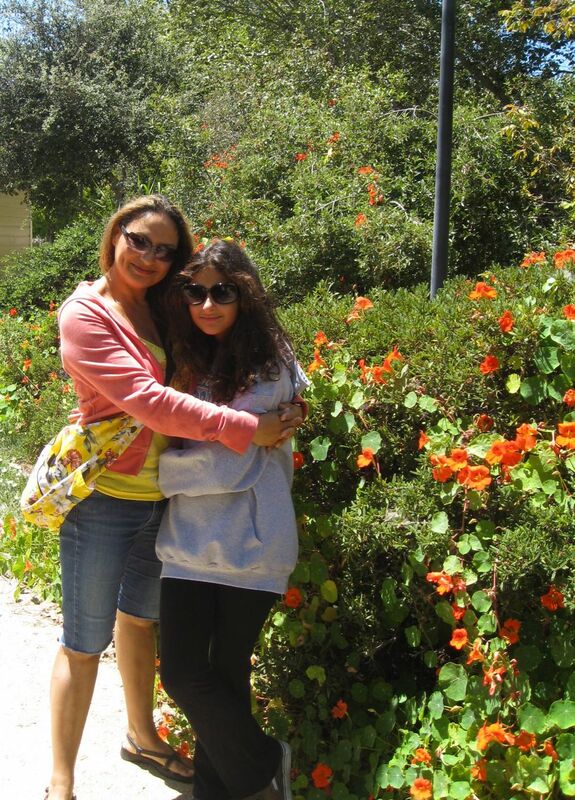 My daughter Maya and I can’t help but feel energized and refreshed in this garden, overrun with orange Nasturtiums! I’m not saying to have an “all orange” garden, I’m just suggesting that you add this powerful, spirit-lifting color to your garden! Your purple plants will welcome the company and so will your sad lawn. Orange California poppy Eschscholzia californica) in bloom. The orange, California poppy is the California state flower. Cheerful and bright, don’t let the wiry stem and paper-thin petals fool you into believing that it is “just” an ephemeral flower! Once the California poppy sets seed in your yard, it will be back and spread its cheer all over your neighborhood in the spring. The California poppy seems to need very little care, (water, fertilizing), it doesn’t even need permission to be in your yard! 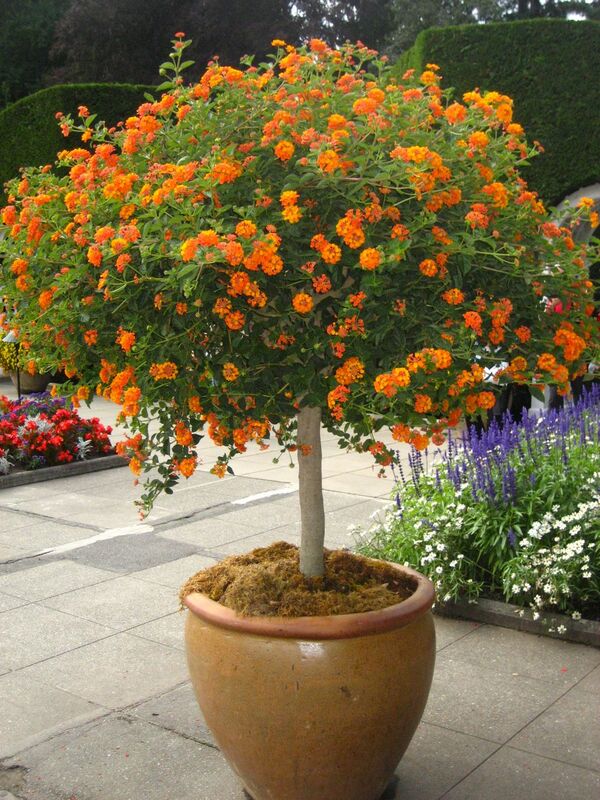 “Spreading Sunset” variety of lantana provides profuse orange/red flowers year-round in frost-free areas. Give it full sun and it will bring the butterflies to your garden! 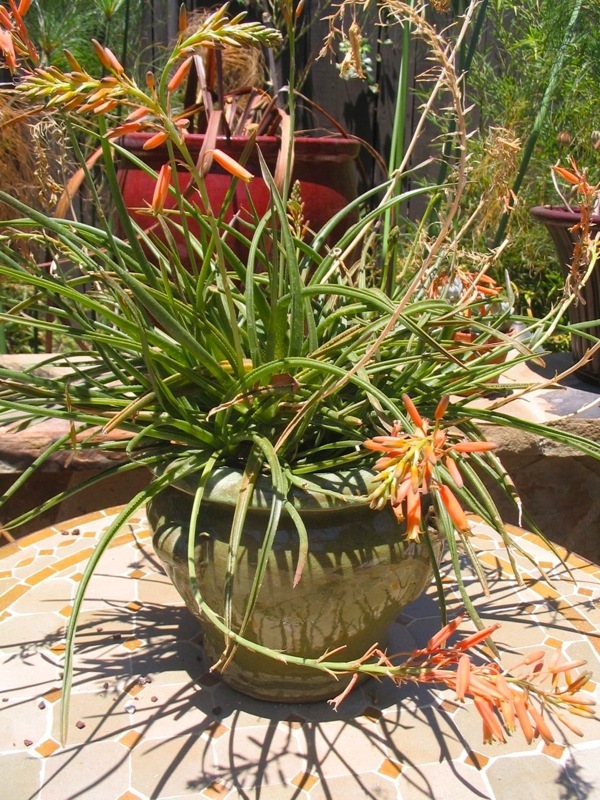 Aloe “Grassy Lassie” does equally well planted in the ground or in a container. Deep green narrow leaves with bright orange flowers that bloom most of the year. 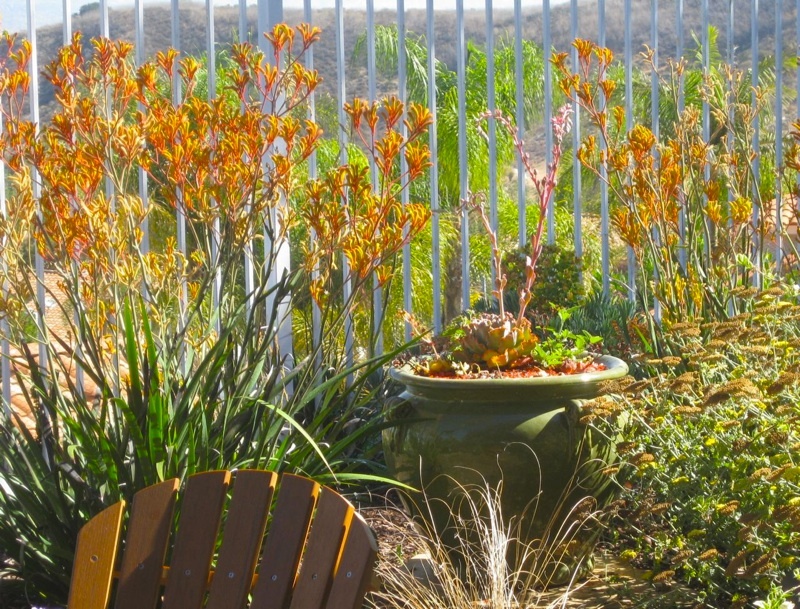 Towering, Anigozanthos “Orange Cross,” (kangaroo paw) is a tall airy plant as well as an evergreen perennial. Full sun, occasional water in summer. 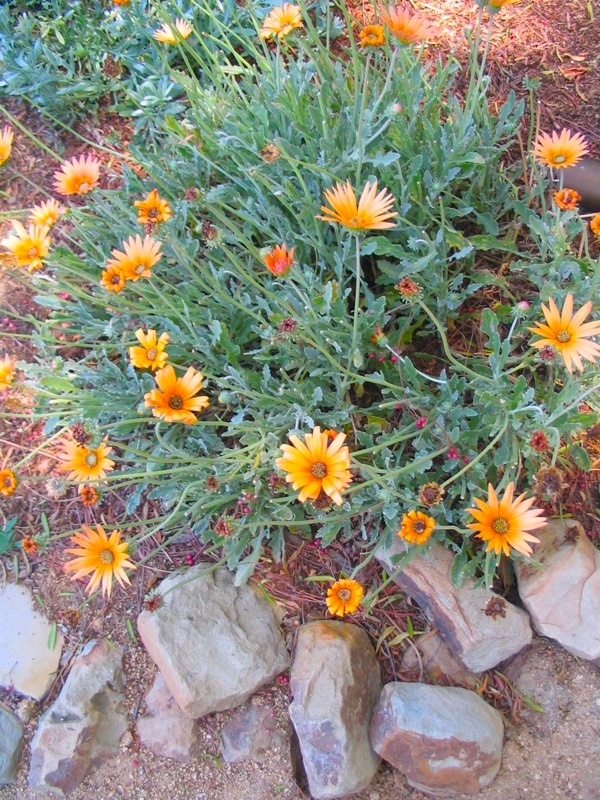 I can’t remember when this Arctotis “Sun Spot Orange” has not been in bloom in my garden! I just keep deadheading and more flowers come! Compact, mounding habit and evergreen, bright tangerine flowers. Arctotis pairs well with silvery Senneccio and red Salvia. Only 3 colors, but large impact! 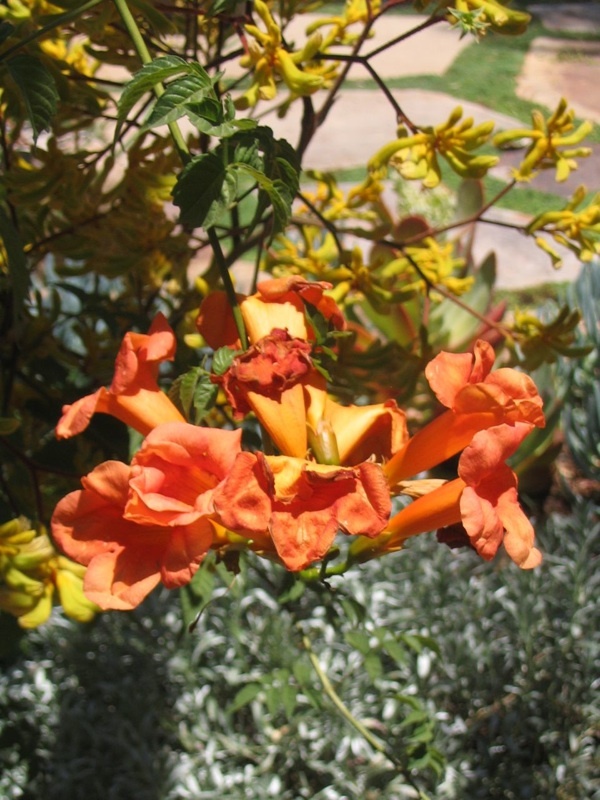 Vining, Campsis radicans, (trumpet vine) thrives in my garden with lots of sunshine and some neglect! 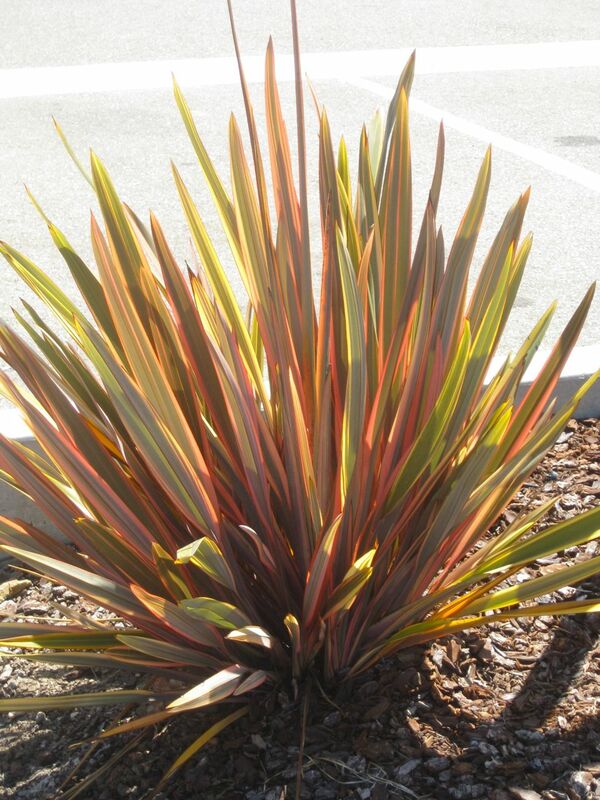 Phormium “Rainbow Queen” sports an olive green to bronze central stripe and apricot margins. This stately plant sets off other plants around it. “Rainbow Queen” phormium and orange lantana. Shades of orange, coral, and bronze. 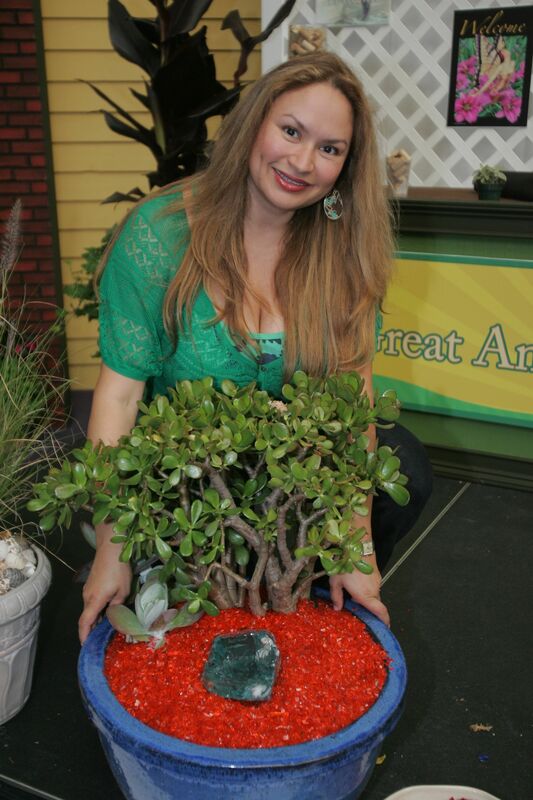 Why stop at orange plants when you can detail a simple potted jade plant with recycled, tumbled orange glass! Don’t forget your house can be part of the garden color scheme too. Looking for more water-wise garden design ideas? Subscribe to Eden Makers blog for notification of new blog posts! I answer 100% of all questions on my social media platforms. Beautiful, shirley! Maybe you can help me identify an orange-flowering plant I bought but lost the name. It is an upright shrub, said to grow to 6 feet. Every 6″ or so on the uprights, along with bunches of small leaves, is a ball of two-inch-long hairy orange flower bracts. When the bracts drop off a hard dry seed-pod-bunch remains on the stem. Very drought-tolerant. I want more! thanks for the work of Shirlley. she had contributed very will here. and she is very nice looking and pretty lovely lady too. I have a nice, dense turf. I watered it a week ago, and mowed 2 weeks ago. We had one rainy day that put about 1/2 inch or water on it, which helped, and it’s averaging 10 degrees cooler now. It’s down to 103 from 113. We tilled in several cubic yards of compost before planting, and have clay soil. I was watering 3x daily at first, then 2x daily until the runners were overlapping and shading the dirt, once at about 8AM and once about 1PM to keep the surface moist. oh, pleasy pleasy no… After about 72 hours of obsession over the color palatte, I just decided today that I want the orange (really my favorite color) out, and want in with the violets, blues, and bright pinks…I pulled out all the orange just this afternoon. You’re making me feel some major regret with your pretty pictures and good points!!! Maya’s a cutie – my daughter is also nearly as tall as me. It’s fun! I’m due for another update. I have a slow launch apparently, (according to the UC Verde specialist who visited me recently). I’ve been instructed to add some compost to the exposed soil to help retain moisture levels, feed a little nitrogen and up the water just a bit. My soil is drying too much and the stolons are having trouble clinging to the soil. How is your UC Verde doing? You put so much work in to this post. 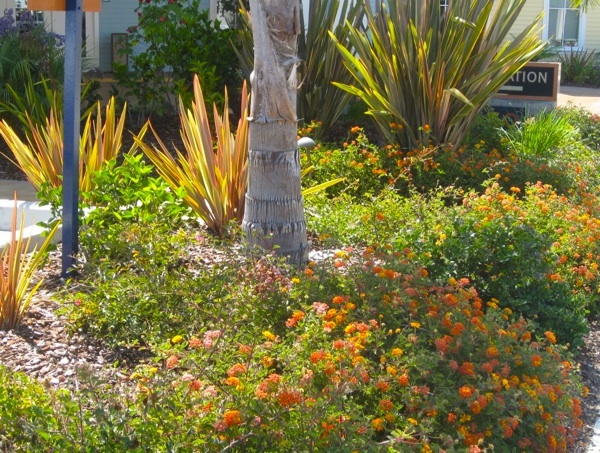 I don’t mean all the writing but all the years of planting and making these beautiful orange and green garden scapes. Very pretty Shirley. Thanks for dropping in MissDaisy! I think I will do the same and follow you to their blogs as well. I live in the 2nd driest state in the Nation and I find that in August my plants start to struggle. 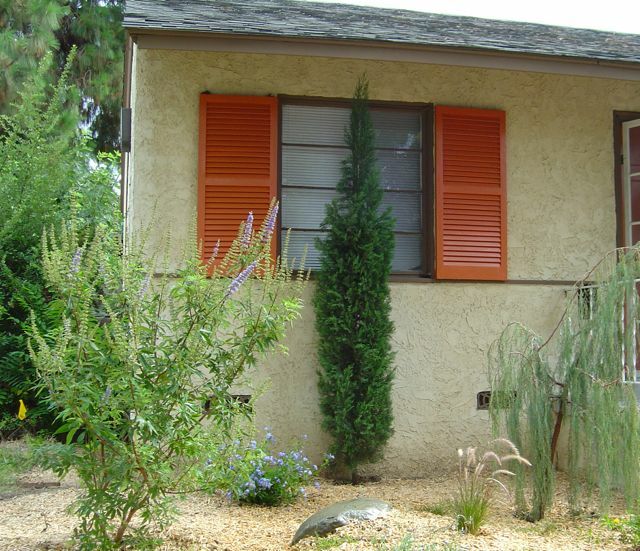 Fortunately, using more native plants helps with the drought-like conditions. I’m stopping by to visit my fellow blogger featured on wowOwow.com. See you around!